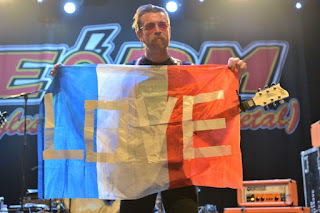 Directed by Colin Hanks, Eagles of Death Metal: Non Amis (Our Friends) is a documentary film about the American rock band who were part of one of the most horrific terrorist attacks in the 21st Century where the band cope with the people who were killed at the Bataclan club in Paris on November 13, 2015. The film follows the band and their cult popularity in Europe including France as well as the aftermath of the terror attacks in November of 2015 that shook up France as well as the band. The result is a compelling and eerie film from Colin Hanks. 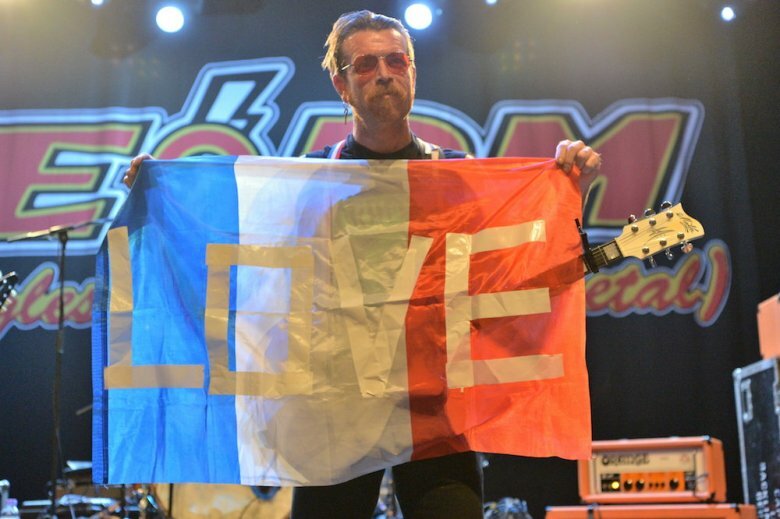 On November 13, 2015, one of the most horrific terrorist attacks emerged on a normal day in Paris, France as one of the buildings was attacked was the Bataclan club where the American rock band Eagles of Death Metal were playing as 89 people were killed. The incident would shape the band, which is co-founded by vocalist/guitarist Jesse Hughes, as they would survive the attack but would leave them mentally and emotionally scarred. It was a night that no should’ve experienced as the film isn’t just about the attack but also about the band returning to Paris in early 2016 to finish their show to the audience that was there in that unfortunate night. Director Colin Hanks doesn’t just follow the band, which is also co-founded by Joshua Homme of Queens of the Stone Age, who cope with the incident but also showcase how it was formed as it’s a band that largely features Hughes and Homme along with guitarist Dave Catching and a revolving door of members including drummers who fill in for Homme when he’s involved with Queens. Though the band has only attained moderate commercial success, they are a popular live band as they were promoting their 2015 album Zipper Down that year where they were in Europe. Homme wasn’t on tour as he was at home expecting the birth of his third child with wife in punk rock vocalist Brody Dalle. The attack at the Bataclan club is shown as Hanks interview some of the survivors at the show and their own recollections into what happened. It’s some of the most sobering and poignant moments of the film as it even the band also describe what they saw. Hanks wisely doesn’t show what happened during the attacks as he prefers to let the survivors tell their own story but also reveal that they were part of something much larger as the attack in Paris on that horrible day affected the city in such a way. Hughes and Homme get emotional into what happened with Homme trying to call Hughes from his home in Los Angeles as he would do whatever he can to get Hughes, the band, and other personnel home. Also interviewed in the film is Bono and the Edge from the band U2 who would give Eagles of Death Metal a chance to play a song in Paris just weeks after the attack. With the aid of cinematographer Boyd Hobbs, Hanks would keep things very straightforward for much of the visual approach of the film as well as doing the interviews. Editor Darrin Roberts and sound editor Richard B. Larimore would gather not just archival footage of shows that the band played but also some of the events of the attack with the latter providing some audio into what was happening. Much of the music in the film largely consists of music from both Queens of the Stone Age and Eagles of Death Metal along with some ambient score music by longtime Queens associate Alain Johannes. The music is an important aspect of the film as it show what Eagles of Death Metal is all about which is good ol’ fashioned rock n’ roll music. Eagles of Death Metal: Non Amis (Our Friends) is a marvelous film from Colin Hanks. It’s a film that explores not just one of the most horrific events in recent history but also the rock band who was at the center of it when all they wanted to do was play rock n’ roll. In the end, Eagles of Death Metal: Non Amis (Our Friends) is a remarkable film from Colin Hanks.